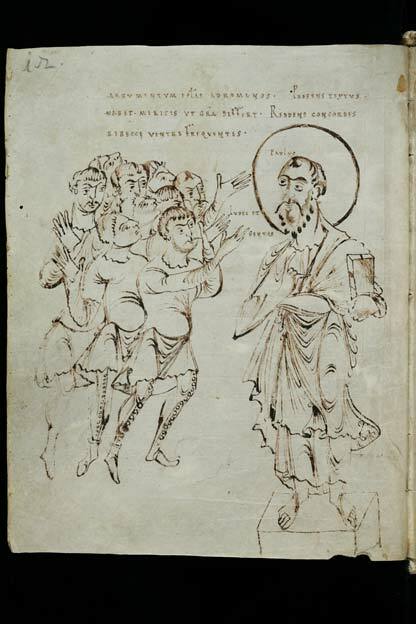 From a copy of the Pauline Epistles and copies of Alcuin's works "De dialectica" and "De rhetorica" and of the work "Peri hermeneias"
The picture accompanies an introduction to a commentary on one of St Paul`s Letter to the Romans. The author is the monk Pelagus who tells the tale of a a dispute between the Jews and Gentiles of St Paul`s day who had converted to Christianity. They believed that each group was more deserving of salvation. In Romans 9 and following St Paul addresses Israel’s unbelief and its rejection of Jesus as saviour. He discourages both complacency and anxiety on the part of Gentiles. To those who might boast of their superior advantage over Jews, he warns that their enjoyment of the blessings assigned to Israel can be terminated. 12 not by works but by his call—she was told, “The older shall serve the younger"